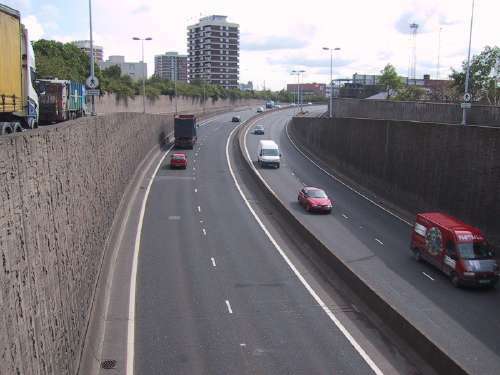 PLACE Blog: The Westlink: Solution or Problem? How the Belfast Urban Motorway system could have appeared. In this image you can see the Ormeau Road and the Gasworks. 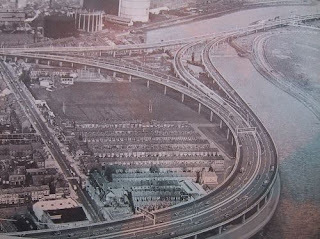 As the 30th anniversary of the opening of the Westlink passes, John Bennett considers the controversial plans for the Belfast Urban Motorway, and why it never came to fruition. Three decades ago when the West Link was opened the motorists of Belfast were hoping that the endless queues and jams were at an end. The idea of joining the two main motorways had been part of a much bigger plan called the Belfast Urban Motorway - a six lane, stilt-borne thoroughfare which was to encircle the city and continue across Belfast Lough via a brand new bridge. Alas it never happened! The traffic continued to build up - the jams increased. The onset of The Troubles added to the problems and the newly constructed carriageway became a concrete dividing line between communities. This week we examine the political, engineering and social problems which have beset the scheme since its inception and ask if the planners could have done better. The Westlink ('canyon section') as it appears today. Photo by Wesley Johnston from www.wesleyjohnston.com/roads. The episode is available on iPlayer for 3 more days until Sunday 7th August. Definitely worth a listen! Also available on iPlayer is a clip from 'Tomorrow's Road' (first broadcast in 1972) which outlined some of the construction challenges with the Belfast Urban Motorway.